The Fishing Has Been Great, but the heat makes it hard to do it all day. We have been doing 4 hours in the morning and 4 hours in the evening and it has been working out great. 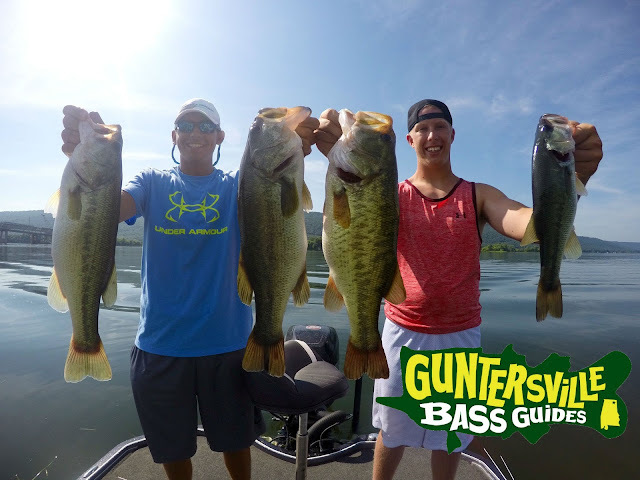 Each 4 hour trip we have been catching 8-10 bass and losing some to go with them. I got to fish with these two young anglers from PA for 3 4 hour trips, We had a blast every trip Trey aka Seth and Tyler aka Mark. Keep an eye out for these two off the water Tyler is going off to collage to play Golf and to my understanding he can Drive the ball close to what the PGA guys are doing and Trey is going off to play Baseball and has the resume to be playing pro in a few years. And if they don’t work out in the golf or baseball world they’ll have Bass Fishing to fall back on! We have a few things working for us the first is a NetBait 15inch c-mac worm Texas rigged fishing it in 8-12 feet of water secondly a 4×4 Bass Jigs Kevin Hawk Football Jig in that 16-20 feet with a Paca Craw as trailer and third is a 4×4 Swim Jig up shallow with a little spanky as the trailer. One last thing, PLEASE DONT THROW YOUR PLASTICS IN THE WATER, THROW THEM IN THE TRASH OR SELL THEM TO COMPANIES THAT RECYCLES THEM. You will see a pic of a mag trick worm that was hanging out of a mouth of a bass no hook no line. I have days open to fish with you!